It’s 1986. The media is preparing for Hands Across America – the music-industry sponsored effort to raise funds to combat hunger in America, much as USA For Africa and the Live Aid concert had done the year before to combat hunger in Africa. An elementary-aged girl is visiting a boardwalk theme park with her parents in Santa Cruz. Her dad wins her a Michael Jackson Thriller t-shirt playing an arcade game. As he settles in to play another, Mom visits the ladies’ room and the girl wanders off. On the beach, she enters a seemingly abandoned house of mirrors, only to be terrified by a likeness of herself – not a mirror image, but an exact body double, able to move independently from the young girl. And all this activity occurs before the opening credits of Jordan Peele’s new thriller, “Us.” Peele is the director of the highly-acclaimed 2017 picture “Get Out.” My big problem with “Get Out” was that the premise set us up for an enticing social commentary film on how bourgeois white people view African-Americans. 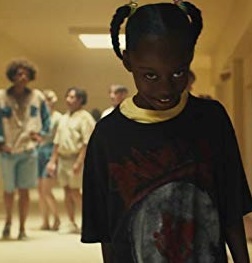 I was disappointed that about halfway through, Peele’s original screenplay abruptly switched course and devolved into a standard horror flick – rather than dealing with the issues it proffered at its outset. With “Us,” Peele pulls no such punches. This is a horror film from its origin – and I like the fact that his screenplay (again, original) establishes its own reality early on. “Us” is as good as any Stephen King horror story ever filmed (and to clarify, I’m not considering “Stand by Me” and “The Shawshank Redemption” horror films). Fast-forward to present times, and the little girl now has a family of her own. Adelaide Wilson (played by Oscar-winner Lupita Nyong’o of “12 Years a Slave”) is married to Gabe (Winston Duke), and their two kids are Zora and Jason. By all appearances, they are as “normal” a family as one could find. Teenage Zora has just earned her driver’s license, and spends most of her time on her phone – often with headphones in her ears. Middle-school Jason likes to wear masks and perform magic tricks. Zora considers him “weird,” but he’s as typical as any 12-year-old boy you can imagine. The Wilsons are in the habit of vacationing a week each summer in Santa Cruz. They rent a home there, and are friends with the Tylers (Elizabeth Moss and Tim Heidecker), another typical upper-middle class family, with two teenage daughters. The Wilsons and the Tylers apparently know each other from their summer vacation rentals. But this year, Gabe suggests something different from previous years. This year he decides to take the kids to the beach and boardwalk – the same beach and boardwalk that terrified young Adelaide back in 1986. How will Adelaide confront her fears? No sooner do we experience the momentary “disappearance” of Jason on the beach (where he ironically uses a port-o-let adjacent to the still-abandoned house of mirrors) than the Wilsons are confronted by a power outage and the subsequent appearance of a strange family standing outside their beach home on the driveway. Turns out this family is comprised of doppelgangers (exact duplicates) of each member of the Wilson family. The doppelgangers then proceed to terrify the Wilsons, with each body double exacting its torture on the corresponding member of our heroes. And just when we’ve had enough of this story arch, we learn that the Tylers also have their own body doubles. Does everyone? And if so, what can be done to stop the horror? Can they be stopped? Can they be killed? Again, this is the stuff of Stephen King; but “Us” is so eloquently crafted it rises above 90% of the filmed adaptations of King’s stories. Peele has a real feel for horror, and even as the story becomes less plausible heading toward its apex, it’s always true to the reality established at the beginning. And the denouement following the logical conclusion is enough to raise the hair on the back of viewers’ necks before heading to their cars. “Us” rivals last year’s “Hereditary” as the best horror film to come along in years, and (unlike so many of this genre) every twist and turn makes good logical sense. Aside from the tight screenplay, creepy score (Thank you, Michael Abels), and pinpoint direction, I was very impressed with two other aspects of “Us.” First, the fact that the Wilsons are a black family has absolutely nothing to do with the story. In other words, the family’s blackness doesn’t matter at all. Had they been a white family, “Us” would have worked equally as well. And much as with Stanley Kubrick’s classic “A Clockwork Orange,” this is a very violent depiction of terror – yet not only is not a single person killed by gunfire, we don’t even see the existence of a firearm! Hollywood has so numbed us to the abhorrence of artillery it’s almost more frightening to experience such anxiety absent its presence than with it. I’m sure I’ll see better films in 2019 than “Us;” it’s still early. But for one fourth of the way into the new year, I can’t say I’ve been more impressed with anything I’ve seen. “Us” is a winner – more focused and more ghastly than “Get Out,” and the film that establishes Jordan Peele as the new M. Night Shyamalan.